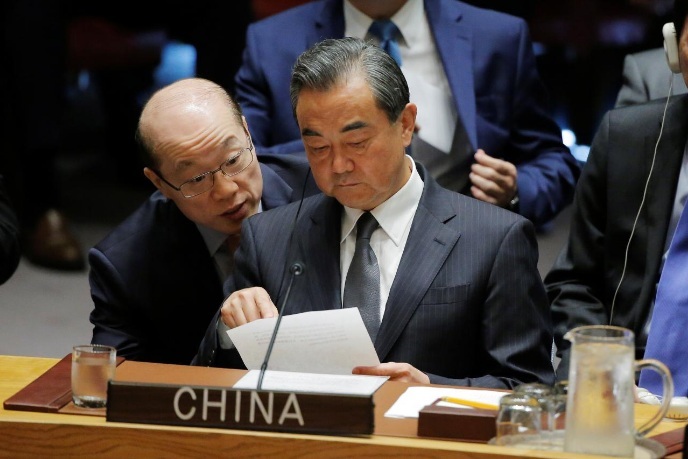 Chinese Foreign Minister Wang Yi listens to China's Ambassador to the United Nations Liu Jieyi as he attends a meeting of the Security Council to discuss peacekeeping operations during the 72nd United Nations General Assembly at U.N. headquarters in New York, U.S., September 20, 2017. BEIJING - The situation on the Korean peninsula is getting more serious by the day and cannot be allowed to spin out of control, Chinese Foreign Minister Wang Yi told his German counterpart, the state-run China News Service said on Thursday. A resolution to the North Korea issue cannot only rely on sanctions and not talks, Wang said, meeting German Foreign Minister Sigmar Gabriel on the sidelines of a United Nations meeting in New York on Wednesday, the report added. The situation on the Korean peninsula is getting more serious by the day and cannot be allowed to spin out of control, Chinese Foreign Minister Wang Yi told his German counterpart, the state-run China News Service said on Thursday.